French mobile phone and portable media manufacturing company have only recently released a new phone to add to their growing line of oddly named smartphones. The new device called the ARCHOS 55 Diamond Selfie is neither made of diamonds nor does not help you up your selfie game in any way. Well, we would not have expected the ARCHOS 45 Helium to be made of actual Helium, but anyways, you get what we mean. The official website describes the ARCHOS 55 Diamond Selfie as an elegant and trendy smartphone, which is mostly true giving that the 55 diamond features a metal and glass hybrid body including its reinforced glass, scratch resistant backside and metal details. Armed with a large 5.5-inch (1920 x 1080) Full HD screen, the ARCHOS 55 Diamond Selfie offers an extra large immersion experience of all your media content. The fully laminated IPS display brings accurate colour reproduction as well as optimum and gorgeous screen definition for your photos, videos and web surfing. The 55 Diamond Selfie smartphone carries the high rectangular design with curved edges, has physical volume and power buttons and on-screen navigation controls. It is quite a shame that the device does not launch with Android 7.0 Nougat out of the box, guess we will have to settle for the next best thing. The 55 Diamond comes with a near stock version of Android 6.0 Marshmallow; Archos are yet to confirm if there will be an upgrade to Nougat shortly. The smartphone features a lower but equally powerful Qualcomm MSM8937, Octa-core Cortex-A53 1.4GHz and Adreno 505 GPU. 64GB of internal storage and 4GB of RAM are the only available options for the device; there will be a dedicated microSD slot, which will be able to carry up to128 GB. Archos are quite formidable on the camera front as the device carries a 16-megapixel back camera with LED flash. The camera comes with features such as, phase detection autofocus, geo-tagging, touch focus, face detection, HDR, panorama and will video in 1080p@30fps. The front camera is an 8- megapixel shooter with Screen Flash and 1080p video capabilities. 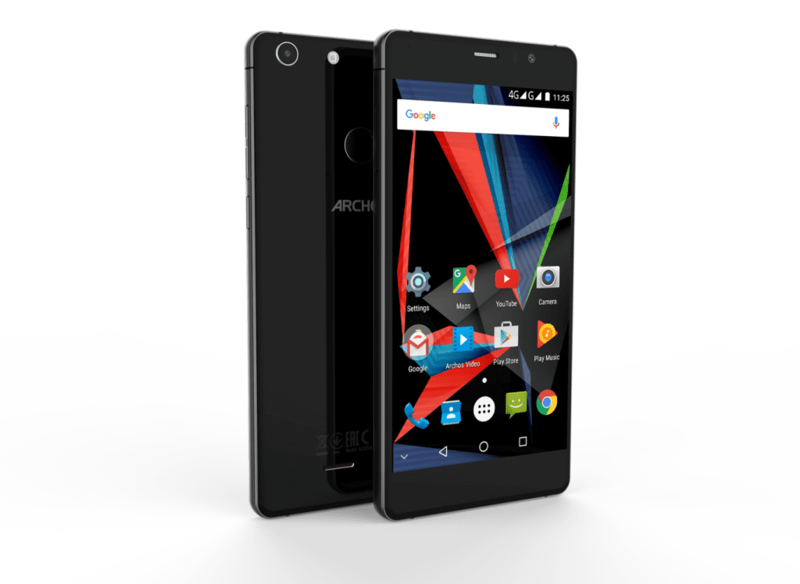 Archos 55 Diamond selfie is a dual-SIM device with SIM and micro SD card combinations ( 1x Nano SIM + 1x Mini SIM or 1x Mini SIM + 1x micro SD card), all of which offer support for all GSM, HSPA and LTE network bands. The device launches with dedicated Fingerprint scanner. The 55 Diamond supports accelerometer, gyro, proximity, barometer, compass, colour spectrum sensors. The device also has a lite variant with 3GB of RAM and will be released in October for $169.90 while the current version is available for $199.